When the driver hits the brakes this pressurises a hydraulic system which causes the brake pads to squeeze against the discs which causes the car to slow down. If the ABS system detects that one wheel is slowing down more rapidly than the rest (a symptom of wheel-lock) it automatically reduces the brake pressure on this wheel by opening a pressure release valve in the hydraulic system. ABS also has the ability to build the pressure back up via the hydraulic motor. The system reacts remarkably quickly, and compared wheel speeds many times a second. ABS systems can act on just the front wheels (which do most of the braking work), or all four depending on what car you’re driving. Diagram 2 (above) shows the whole process in more detail. 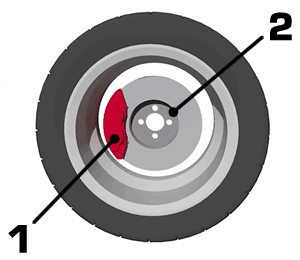 The four wheels shown are braking heavily as a result of heavy brake pedal application, and the green wheel is about to lock up due a low friction surface such as ice. The ABS control module (B) detects the onset of a skid through the sensor (A) in this wheel and reacts by releasing the brake pressure slightly by rapidly opening a pressure release valve (C). This lowers the pressure in the brake pipe (D) which causes the brake caliper to loosen its grip on the brake disc on the locking wheel. If this corrects the locked wheel, the hydraulic motor (C) will build up the pressure again to the optimum braking force and the valve will revert to the closed position. If you’ve ever seen a car with ABS operating, you’ll notice that the wheels appear to lock and release in jerky movements, this is because there is such a fine line between grip and traction loss in these conditions, and the system constantly tries to keep the pressure at the point just before lock up (which is the most effective pressure for slowing down). There are two main types of modern ABS systems: three and four channel. Three channel systems control the braking pressure on both front wheels independently, but control the rear wheels together as a single unit. 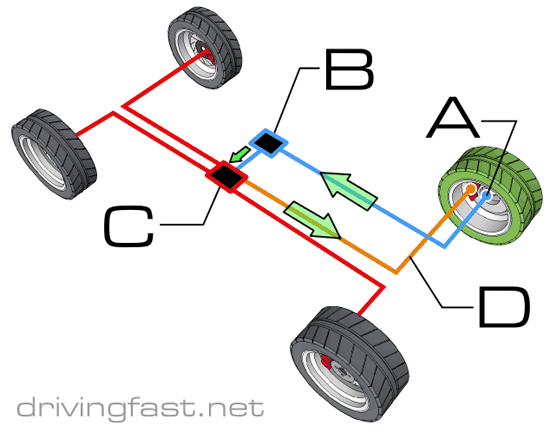 Four channel systems (as shown in Diagram 1) control the brake force on each wheel independently (assuming you’re in a four wheeled vehicle!). In three channel systems, although both rear wheels are monitored by sensors, if wheel lock if detected on a single wheel the hydraulic braking pressure is reduced equally on both wheels. This does not provide the level of control of a four channel system, and thus three channel versions are compromised and usually only fitted to cars to save on cost. Most modern cars now use a four channel ABS systems which provide greater safety in emergency braking conditions. The ABS ECU contains thousands of parameters which can be tuned for the car – although most ABS systems are supplied by companies such as Bosch, it’s the software tuning which makes individual systems different for different cars. Vehicle manufacturers must strike a compromise between stability and the braking distance they hope to achieve, and must also set parameters for braking on different surfaces and scenarios. Even if two different cars have identical ABS hardware – it will have been tuned very differently for a sports car compared with an SUV. How can I make best use of ABS? ABS works best with a firm, steady application of pressure to the brake pedal. During ABS operation you’re likely to experience some vibrations, which are the pressure release valves opening and closing and an indication that the system is working correctly. Don’t release the pedal until you have safely stopped. You may have heard that it’s possible to slow down quicker in a car without ABS. This has elements of truth, but in practical terms the benefits of ABS massively outweigh the slightly longer braking distances. For road use, ABS is an absolute must as it will allow you to steer out of the way of unexpected hazards. Diagrams 2 and 3 below explain the practical reasons for ABS. 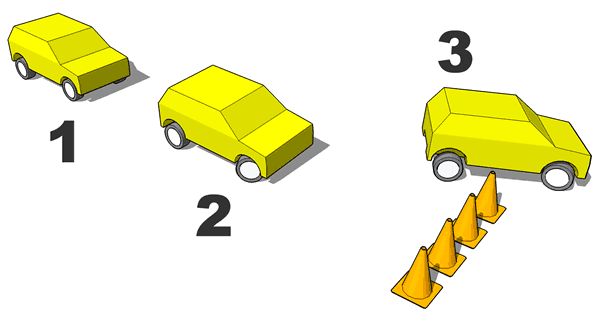 In the diagram above, the driver hits the brakes hard on a slippery surface (1), then steers (2), and successfully manages to avoid the obstacle. ABS prevents the wheels from locking, and this allows you steer. Without ABS, as the driver applies the brakes the wheels lock (1). 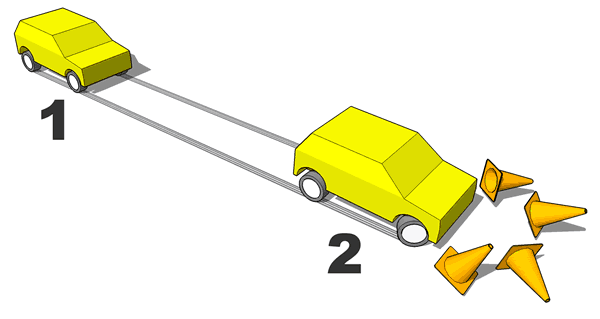 Despite applying steering lock, the car continues straight ahead due to the loss of steering control (2) and a collision results. If done correctly, threshold braking can slow a vehicle more quickly that a car fitted with ABS (in the right conditions). Many competitive racing drivers would say that they prefer their cars not to have the system. However, to gain maximum advantage you will need to practice the threshold braking technique repeatedly. A good test is to find a section of test-track, and mark out a cone which will act as the braking point. Accelerate to 60 or 70mph and brake as hard as you can in a car equipped with ABS, then repeat without ABS. Compare the stopping distances by having someone mark them on the side of the track, then practice threshold braking until you notice a marked improvement. If you do have ABS fitted, don’t get into the habit of locking up wheels before entering a corner – this isn’t the quickest way of slowing down and can unsettle the car.